Spring and Summer wedding season has begun and with all the excitement comes the age old question ‘What should I wear? !’ Whether you’re going to a Country Wedding, a Church Wedding, a Beach Wedding, an Outdoor Wedding, a Cocktail wedding or Black Tie Wedding, we’ve got you covered for all of your Spring and Summer weddings with our break down of Spring / Summer wedding dress codes, our top picks of Spring / Summer wedding guest dresses and some style tips for the men too. The obvious don’ts apply: don’t wear anything too short or too flashy and please don’t wear white! Heading to a country wedding this Spring/Summer? As the weather warms up, so too our calendars. It is well and truly wedding season, and those RSVP’s are stacking up as love fills the fresh air! But the conundrum of what to wear and choosing an appropriate outfit for such an important event is enough to send us in a tizzy! For a country wedding – which can include a garden/outdoor, barn, backyard or rural setting – the traditional wedding dress code can almost be tossed out the window because for these events where guests will be spending the most part outside, clothing to mimic this and to also provide comfort is a must. The biggest advice for a country wedding is to dress to match the occasion. Unlike black-tie, a country or outdoors style wedding requires a level of comfort but still some formality. You don’t want to be wearing jeans for example, but there’s room to be a little less strict and formal. Leave the silk behind however, and opt for bohemian styles of dress or dresses with an air of fun to them. Playsuits are a good example of a perfect country wedding outfit for guests. Guests who have been invited to a country wedding can have some fun with floaty fabrics and bohemian style dresses. Shift style, sleeved and lace dresses are all good options for an spring / summer outdoor event. Pair with some comfortable shoes such as wedges or flats or a thick heel (keeping in mind the grass and cobblestones underfoot) to ensure practicality and style throughout the day. When it comes to details, hair left loose and romantic will look gorgeous, and if you want to glam it up try an intricate headpiece such as this Gold Filagree Leaf headband by Olga Berg or a floral crown. Our pick of dress is the Thurley Tryst Gown. For more gorgeous dresses to wear to an outdoor wedding or occasion, have a look at our Daytime Event collection of dresses. Choosing the perfect dress for your bridesmaids is a daunting task, but thankfully we have some ideas on country wedding dress styles which look both formal but suitable to an outdoor occasion. Choosing a colour scheme can be a good way to start, and this season is all about forest greens, powder blues and metallics. The Thurley ‘Bed of Roses’ dress is our gorgeous pick of the bunch, with its vibrant green hue and intricate floral and vine guipure lace. For more bridesmaid dress ideas, look to our range of Bridesmaid Dresses available to rent. A country wedding calls for a special type of wedding dress. Look to rustic style dresses in simple cuts for a laid-back affair, or go traditional with a modern twist such as with this caped dress from Thurley. This dress would look striking paired with a floral crown or headpiece and a country bouquet of wild and native flowers. Just like a beach wedding, a casual rustic ceremony is the place for a more relaxed style of dress with an almost vintage feel to it. Antique whites, ivories and creams are great colour choices. Dressing for a Spring/Summer wedding is a challenge within itself for the gentlemen, and a country wedding could make the task even more difficult! The basic rule of thumb is to keep dress sensible and look to a colour palette consisting of pale grays or opt for a pale blue suit. Cotton and linen shirts is totally acceptable, and can be an alternative to the more structured and constrictive tuxedo suit. Shoes should be neutral; a stylish loafer would be a good choice. 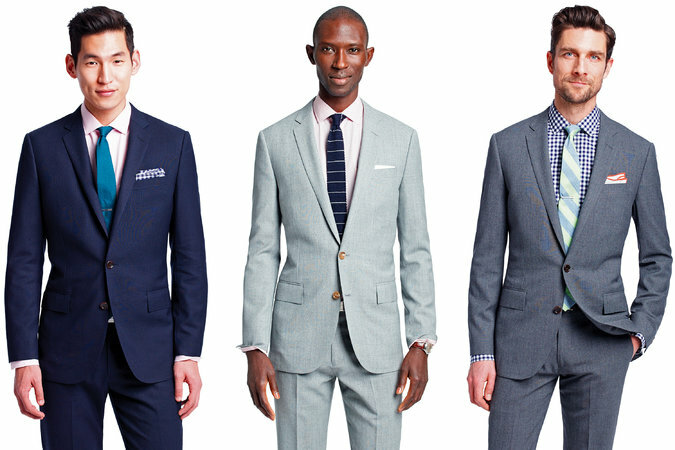 For suit jackets, linen, unlined or a single breasted jacket are all sensible options. Unless stated otherwise, bow ties and formal ties aren’t a necessity, but perhaps look at a decorative pocket squares for a stylish look. Typically on the more traditional side, a church wedding doesn’t mean the occasion calls for solely floor length dresses and matching skirt suits. With beautiful stained glass windows and the gorgeous vibes of soaring ceilings and candlelight – whether it be a small country chapel, or a large city Abbey – attending a church wedding calls for the absolute best when it comes to your outfit. For every guest that will attend, no matter what your style, we’ve put together a list of our top trends for a church wedding. So, read on, then head over to GlamCorner and rent yourself a perfect church wedding outfit for a fraction of the retail price! Mexico has forever played an important part in designers’ inspirations. Bright colours, floral embroidery and fanciful design inspired by the bold and beautiful Mexican culture and incredible traditional fabrics have infiltrated the haute-couture runways for years. Look to dresses with a big, bold print such as this Fiesta Dress by Thurley. When sporting something inspired by Latin American culture, it’s not done properly if done in small doses. As this is a church wedding, opt for a design that draws from a more classic silhouette (think cap sleeves, knee-length hemlines and a-line skirts). Pair back the bold floral print with a classic pump (in a matching colour to the print, preferably) and a cute little box bag to throw all your essentials in. Think classic style, but with a modern day twist. While we certainly aren’t suggesting you wear something similar to what the Queen would for a royal wedding, there’s something to be said for timeless style. Draw inspiration from the beautiful guipure lace worn by the bride, by opting for a bold patterned lace two piece. (Or trick two piece). The slightly more open weave of guipure lace allows for the intricate detailing to be highlighted throughout the outfit. Team a pencil skirt with graduating hemline with a matching crop top (ensuring the waist band of the skirt meets the the hemline of the top). Pair the matching skirt and top with a classic slingback stiletto and fine jewellery for a perfect church wedding outfit. Jumpsuits are slowly but surely making their way back into the fashion. This time, however, they are without the denim flares and lycra one pieces. Take this as a very, very good sign. While designers are constantly looking to the past for future fashion references, they know which ones to use/adapt – and which to avoid! If a church wedding is on your calendar, consider a jumpsuit as the perfect outfit choice for a modern take on traditional dress codes and regulations. The key to perfecting this look is opting for a style that has plenty of design elements, yet is tailored to a T and fits you perfectly. There’s nothing worse than a badly fitting jumpsuit/pant suit. Look to classic styles with a touch of difference: off the shoulder necklines, pockets, smartly placed cutouts or modern materials and patterns. This Self Portrait ‘Bell Sleeve Jumpsuit‘ features intricate daisy lace, sheer bell sleeves and a high collar – the perfect combination of traditional and modern. Steer clear of designs better suited for a cocktail party. A church wedding tends to err on the more ‘formal’ side, and rightly so, your outfit should too. A beach wedding is one of the most romantic and joyous of occasions! If you have recently opened up an invitation to a beach wedding and are even lucky enough to attend one overseas, chances are you are in for an unforgettable ceremony. The sun, the sand, the water – what can be more romantic? Dressing for a beach wedding can be a little tricky, however. Not your traditional chapel affair, a beach wedding is obviously a lot more relaxed and casual and calls for attire that suits accordingly. For women, lighter fabrics and patterns are best; think chiffon, linen and organza. Certain lace frocks also can look luxurious but still comfortable enough for the warmer weather. As for most weddings, it is best to avoid white and black – for a beach wedding it would be best to avoid dark hues altogether. Shoes can be more relaxed, with strappy sandals and wedges the best choice of footwear for wearing on the sand. Often a beach wedding invite will list the dress code as ‘Beach Formal’ which implies semi-formal dresses and summer suits. According to The Knot, Beach Formal suggests wearing anything that you would consider wearing to a nice restaurant on a summer day. If in doubt, do check with the person whose RSVP details are on the invitation for clarification on appropriate attire. For guests, keep it light and chic. Keeping in mind the warmer weather, dress in an outfit that is light and comfortable – there’s nothing worse than sweat patches! Go for soft, flowy fabrics and light colours. Dark colours such as black and navy conduct too much heat so it’s best to avoid these if you can. Why not select colours which mimic the scene around you? Try selecting colours that are ‘cool’ and evoke a tropical feel; cool blues, aquamarines, lime, sand, coral and tangerine are all unique tones which are suitable, too. Don’t be afraid of patterns either. This Camilla sheer overlay dress is perfect for a beach wedding! Constructed with silk chiffon and the famous Camilla print, this dress is a stunning piece. Pair with metallic sandals and gold accessories for a chic look. If the ceremony is to be held in the evening or at sunset, think about styling your dress with a light throw or shawl. Selecting bridesmaid dresses for a beach wedding can follow the same guidelines with the guest outfits above. Dresses should be universally flattering but still in-keeping with the wedding theme. They will be less formal than traditional church or chapel wedding bridesmaid dresses but still have an air of formality. Bright colours look great and really pop against the blue backdrop of the ocean setting. Our pick of the bunch is the Talulah Falls Full Strapless Midi Dress; the vibrant tangerine colour perfectly mimicking an ocean sunset on a tropical hideaway. Have the bridesmaids style their hair in romantic up-do’s and incorporate some bright orange flowers in their bouquets for a stunning effect. Everyone loves a sit down wedding, however in the past few years the wedding world is beginning to see a rise in the number of couples having a cocktail wedding. Whether it be a matter of cost, or that the bride and groom simple enjoy a more low key “party” type affair, cocktail weddings are a perfect way to celebrate the union of two love birds. Cocktail parties generally mean there will be a lot of standing, and potentially outdoors. So when it comes to planning your outfit, knowing what you’re going to wear before the big day will save you a whole lot of last minute panics and worries. Take a look at our top tips for planning the perfect cocktail wedding outfit, no matter what the setting or theme. Attending a city style cocktail wedding? Expect plenty of extra details and modern delicacies, this couple will no doubt pull out all the extra stops when it comes to planning their wedding. With this in mind, planning your outfit will mean a few extra scrolls through Instagram and pins on Pinterest are in order. Most definitely the classiest of cocktail affairs, choosing the perfect outfit means everything is in order and everything plays its part. Our top tip to styling an outfit for a city style cocktail wedding: longer hemlines, slick style and perfect tailoring. Now’s the time to sport your LGD (Little Gold Dress), the extra shine and sparkle will have you standing out from the crowd, for all the right reasons. Look to classic silhouettes, be it figure hugging or 1950s Dior style, then pair it all back with slingback stilettos and a box clutch to fit all the essentials. Whether your from the countryside or not, having a cocktail wedding in a rural setting means plenty of outdoors, plenty of incredible photos, and plenty of (country style) fun! Whether its a full-blown western, or country chic theme, attending a country cocktail wedding calls for some serious thinking for top to toe style. Anything goes, really, when it comes to country style – just don’t wear your levi’s and RM Williams. Opt for a classic style with a modern twist; think backless designs from chantilly lace, in a bold colour of course (deep reds and darker hues of purple). Alternatively, go for a strapless number with an origami style skirt – giving you all the extra room to move and dance around on the dance floor. The beachside cocktail wedding is always one of the greatest to attend. There’s something about feeling like you’ve momentarily transported to a distant pacific island to instantly get the party vibes started. Whether the set up is on the beach or not, expect the vibe to be slightly more low key then say, a city style cocktail party. In saying this, it doesn’t mean you shouldn’t put any less effort into planning your outfit. Expect the bridal party and groomsmen to be wearing relatively “chilled” attire, so follow the overall vibe that a beach wedding conveys to perfectly plan your outfit. Our top tip is not overdo it. Think minimal accessories, minimal makeup: minimal fuss is the overall theme of the day. With this in mind, look for an outfit that will ensure you stay partying all night long. Think soft drapes, lightweight materials with flow and easy to manage styles. Look for colours, fun designs and anything that will match the overall ‘beach cocktail’ theme. This pink Gypsy Eyes by Alice McCall is the perfect mix of fun and flirty, crafted from luxurious fabric and a flattering fit it ticks all the boxes! Here’s your chance to sport a modern jumpsuit or playsuit: plenty of designers are filling their collections with cocktail wedding appropriate designs. Our top tip: avoid looking too casual by teaming the outfit with a pair of block heeled, strappy stilettos; a no-fuss hairdo and fine jewellery to pull it all together. Creating the perfect Spring/Summer black-tie wedding style relies on planning and more planning! Whether you’re the bride, the groom or the guest, the style of dress and attire can largely depend on the type of wedding. If there’s a theme involved, many couples choose to have guests attend in attire which is within the confines of the chosen theme. For example, a beach wedding would see a lot more bohemian styles and lighter, more floaty outfits as opposed to something more traditional and formal. For a black-tie wedding, the rules are quite straight-forward, however. Black-tie weddings are generally more formal and traditional, with the men expected to wear a suit and tie and women in formal floor length dresses. A good indicator of what to wear and what kind of reception to expect lies within the wedding invitation itself. A lot of times, the bride & groom save the hassle of guess-work and list the dress code for guests. If there is no dress code indicated, play it safe by sticking to formal wear, keeping in mind not to wear anything too revealing or ‘showy’. The location and the time/date of the wedding also plays a big role in deciding what to wear. If it is a formal location or if the wedding is being held in the evening, you can assume that the dress will also be a formal affair. If it is an outdoor wedding during the day, take this into consideration when deciding on your outfit and look to conservative styles. For women, the general rule of thumb is to keep it formal in a midi or floor-length gown or a formal cocktail dress. A-line styles are particularly good for black-tie weddings. Remember to keep it dressy and classic and opt for rich hues and fabrics. For a Spring/Summer black-tie wedding or a wedding which takes place during the day or outdoors, look at incorporating this season’s metallic trend with a rose gold dress or a bronze gown with matching metallic accessories. Guests have some room to play around. The one rule of thumb is to keep it classic and traditional, and to avoid white! With the weather warming up, looking to brighter hues can always be a great option, so long as it is still within that formal code. The Double Crepe Aimee dress by Yeojin Bae is a good pick! The sky blue colour and formal square neck design makes it perfect for an outdoor black-tie wedding. Soft pinks, lilacs and mint greens are also perfect colour choices for wedding guests of an outdoor and daytime wedding, while richer colours such as burgundy/mahogany, navy blue and rich reds are ideal for a formal setting or evening wedding. Have a look at the rest of our collection of Wedding Guest dresses for more options! Bridesmaids of a black-tie Spring/Summer wedding can look to more brighter colours to embody the warmer weather and make the reception pop. For something unique, go metallic in a latte/copper brown gown like this Grace & Hart Status Gown. As many Summer weddings often take place outdoors, something floaty and practical is best for the bridesmaid. By choosing colours that pop, the bride or wedding planner can then provide boquets and decorations to complement, making for a very vivid and uplifting affair. For more inspiration, browse our Bridesmaid Dresses available to rent. A formal black-tie wedding calls for a more formal bridal dress. For a Spring/Summer wedding however, the bride can opt for dresses that are more in keeping with the warmer weather; avoiding the heavy fabrics of more traditional wedding gowns and opting for sleek styles in lace fabrics & embellishments. The Renaissance gown by Grace & Hart is our pick of the bunch. This gorgeous ivory gown features beautiful lace floral placement with contrast mesh paneling for a striking look. The mermaid silhouette is perfect for a show-stopping bridal entrance and is flattering on all body types. For the gentleman, we recommend classic formal attire; suit and tie. Keep it traditional in a black suit and crisp white shirt and traditional tie, or adapt to the warmer months by opting for lighter colours in grays, blues and pinks and a contrasting bow tie for a more edgy look. – For women, ‘Black tie’ generally refers to a chic cocktail dress or a long evening gown in a dark or neutral colour. For men, look to a tuxedo, black bow tie and clean leather shoes. – Guests avoid wearing white; particularly the females. Leave the formal white gown to the bride. – For a Spring/Summer black-tie wedding, look at brighter colours in softer fabrics. Lace gowns are perfect for the bride-to-be. – Don’t have the perfect dress? Consider renting one. Have a look at our How it Works page for more info! Staging an outdoor wedding, come Spring time, has its pros and cons. While evidently a seriously beautiful time of the year to say your ‘I do’s’, the odd sunshine shower (or absolute downpour) here and there can be enough to send any bride inside for her big day. However, as the warmer weather starts to roll in, we believe everyone should follow the sunshine as it begins to beckon the newlyweds out from under the marquees, and into the open outdoors. Planning an outfit for an outdoor wedding can be somewhat difficult. Will it rain? ; Will it be cold? ; Do I need sunglasses? ; How about my shoes? … the questions are endless. So, to save you the hassle of a last minute panic attack, we’ve picked our favourite outdoor wedding outfits, just for you. The girls are single handedly the most important part of the wedding. While not everyone can be included in the bridal party, everyone is there to have a great time and help their BFF enjoy her special day. Consider this your chance to embrace your daring fashionable side and stand out from the crowd, (in the most appropriate of ways), by sporting a cute little lace number that will have you oozing Spring outdoor wedding style. When picking the perfect wedding outfit, one must be mindful of the fact that there will be family members attending. With this in mind, pick a dress whose hemline is deemed “Granny appropriate.” Our top tip: if your going for a modern detailed dress (think lace, cutouts, ruffles, sheer materials and hemlines above the knee) balance it out with a high neck or long sheer sleeves. Pair it back with minimal accessories, a pair of sunnies and mid-height gladiator block heels. A cute little clutch is definitely necessary, just don’t forget to collect it on your way out! Everyone wants to look their best on the big day, Mother of the Bride included. Finding the perfect outfit when you’re basically on show as much as the bride herself is a daunting task. Fear not, we are here to help. Outdoor weddings mean nearly anything goes – minus your everyday wear of course. Our top tip: opt for something that just slightly pushes the boundaries. While you want to feel comfortable in what you wear, you also want to stand out from the crowd. Look for luxurious materials, delicate detailing and precious tailoring. Go bold in a deep colour – navy, deep red or muted purple – for a touch of difference from the typically monochrome palette worn these days. Don’t shy away from the shorter hemlines, being the MOB (Mother of the Bride) doesn’t mean you have to stick to floor length gowns! For the more formal outdoor wedding, dress codes can be slightly trickier. Finding something spring time appropriate, that will also suit the black-tie dress code takes some serious planning. Look to dresses that are longer in length, but aren’t over-the-top when it comes to detailing. Avoid sequins and sparkles. Your safest bet is to look for one that’s either floor length or ankle grazing, in a lightweight material, so the skirt can flow nicely as you move around the dance floor. Look for intricate design elements that will make your outfit differ from everyone else’s. Our top tip: modern style cut outs and laces are all the craze when it comes to 21st century black tie dressing. Working with colours, and avoiding black, will make all the difference. While black is certainly allowed, an outdoor wedding should have a certain element of Spring time ‘fun’ about it, so look for something that draws from a palette of Spring inspired colours and patterns. Now you’re equipped with our expert style tips to help you nail your ultimate Spring / Summer wedding look you’re ready to take on the best dressed wedding guest title! Rent the perfect dress for your next Spring and Summer weddings along with accessories for a fraction of the retail cost at GlamCorner. With over 1,500 designer dresses to choose from, we ship your Spring / Summer wedding outfits directly to your front door. Go get em’ girl!